I grew Swiss Chard for the first time this year. My neighbor, Natalie, encouraged me to grow it a couple of years ago but I kept putting it off since I didn’t have any idea how to cook it. She grows the white version every year. One year Natalie couldn’t find any seeds to purchase in the area, so I got her a package online. But I still didn’t want to grow it. Both Natalie and Bill keep telling me that it’s just like spinach. Right! I didn’t have much imagination in comparing Swiss Chard to spinach. It’s much bigger than spinach and I didn’t have even a vague idea what it tasted like, never having eaten it or cooked it. 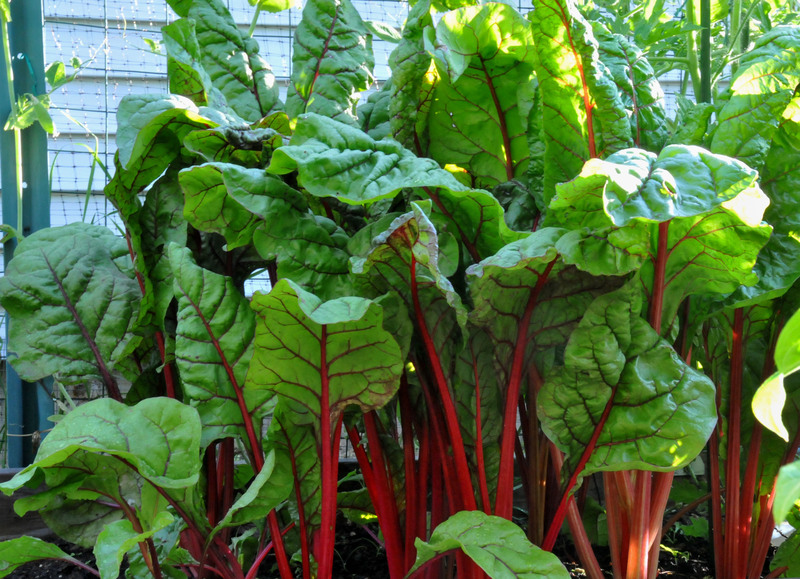 "Rhubarb Chard" gives color to the vegetable garden and tastes great too.. This year I decided to be brave, grow something new that I have no knowledge about. An adventure of sorts. 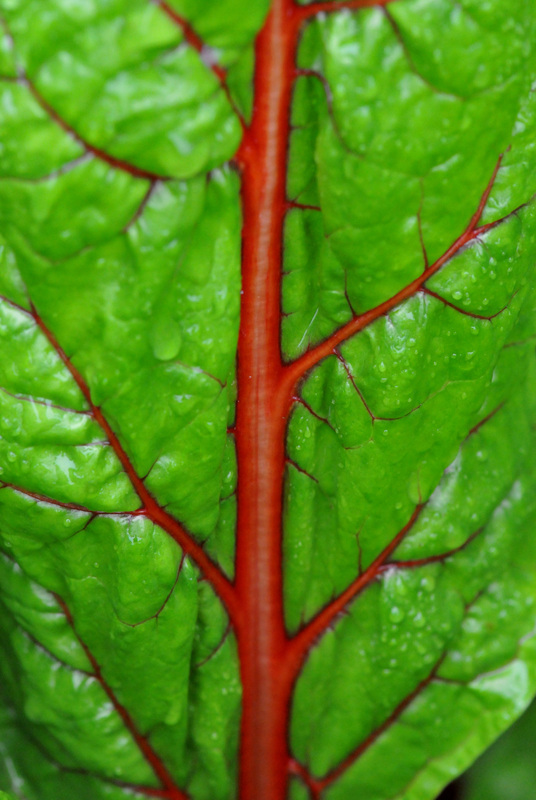 I bought a package of “Rhubarb Chard” from Burpee because of its color, green leaf with contrasting deep red stems. If I don’t like the taste it will still look good as an ornamental plant; what could go wrong. I put a few seeds in the plot in early spring as a test. One seed in each hole, a few inches apart. To my surprise, several of the seeds provided me with more than one seedling. I separated them once they grew tall enough, then mulched around them. They came up pretty nicely, a lot better than the spinach had and grew faster as well. But, I still had no idea what I was going to do with them. The color looked fascinating, looked better in real life than in the photo on the package. What I didn’t expect was how big they can grow. The white swiss chard Natalie has in her garden are only about a foot tall and compact. Mine are over a foot tall and spread their leaves very wide. Bill looked out the window one day and said “I think they are competing with the beans to see who can grow faster and taller.” Their leaves are covering the bush beans growing next to them now. Here comes the brave part. My first use of Swiss chard is in noodle soup. I always use spinach and broccoli in the noodle soup we love. I substitute both the spinach and broccoli with swiss chard since we have so much of it. It was great. It had a very interesting taste and, most of all, made an interesting color of soup. The noodle soup looked pale red instead of clear. Then I cooked it with steamed Salmon where I usually use Broccoli rabe and string beans. To be honest, it’s better than spinach. It has more texture and better taste. Now, I’m hooked. Up close, like blood running in the leaf. As for the growing part, it’s less finicky than spinach. It can take the heat of summer without having to cover it in bright sunlight. What fascinates me is that when I pull it out of the ground and cut the top off for cooking then stick the bottom part back in the ground, it sprouts back up and keep growing. Don’t get me wrong, I only pull out the plants that are too crowded together then replant them back to where I have more space. The ones I want to leave in place, I just harvest the leaves. I decided to kiss spinach goodbye. One less row cover I have to put up. I will add the white and bright yellow versions to the garden next year. And, look for more ways to enjoy them, already have a few ideas. Yum…..